Branched deciduous tree trunks are easy to make in miniature and model scales from wire, acrylic medium, and acrylic paint. The wire forms lend themselves to any size or scale, and they can be finished to a 'leafed out' stage with scenic materials for railroads, punched paper leaves or flowers, or a range of other materials, including furnace filter and kitchen 'scrubby' material or reindeer moss. See the quarter scale 'cloud tree' in the landscaped tea cup scene for a simple foliage effect in small scales. If you wish you can leave your tree forms as branched frames without leaves and use them as Easter or Halloween display trees. The same method works to make trees to display jewelry or photos. You can use any size of wire that suits the size and scale of tree you wish to make. If you want to make realistic trees recognizable as to their species, study the way the branches of a real tree of your chosen species grow out from the trunk and work out a final acrylic coating which resembles the bark pattern of your chosen tree. In these instructions, you will learn how to make a simple generic branched deciduous tree or shrub from wire, paint, and acrylic medium. 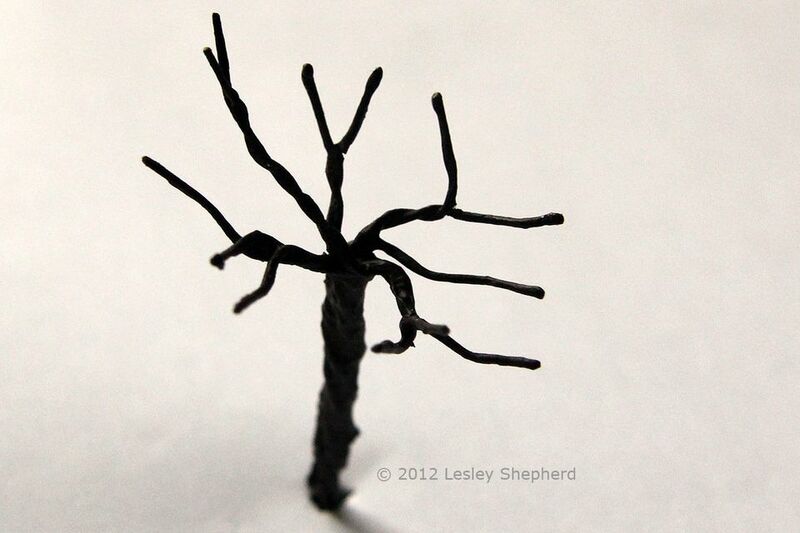 The size and shape of your model tree will be determined by the wire you use to shape it. If you will be adding layers of flowers or leaves to your tree you will need to use wire of a gauge stiff enough to support the leaves or flowers you wish to add. You can use coils or paddles (shown here) of wire. The wire can be from broken electrical cords, remainders of old speaker wire, painted, ​thread wrapped, or paper covered wire. Paper covered wires are best if you will be gluing paper leaves onto your tree. The paper will provide something for the glue to grab onto. The method of twisting the wires to shape your tree will reduce the overall height of the tree, so you should cut your wires to a length one third longer than the height of tree you want. Thicker tree trunks will need many layers of wire, so choose a wire which can be easily bent if you are planning to make larger trees. Copper wire may be easier to bend than hardened steel wire. Before you begin to make your model tree, carefully examine pictures of trees with no leaves, or actual trees before they leaf out, in order to note how long the branches grow between forks, and how the tree reaches or bends towards the sun. Some tree or shrub types have very regular branching patterns. Rhododendrons or pruned fruit trees are a good example of a regular growth pattern. The distance between forks is very similar on all parts of the plant as rhododendron growth in one year puts out a similar length for each new branch that grows from the previous years' outer leaf clusters. To make realistic trees, plan on having at least five wires to group for each major branch. And for small trees have a minimum of three, five wire branch clusters to suggest a full tree. Topiary-style trees will need wires which are all a similar length, trees with several large branches coming from a trunk will need longer wires and more groups of wire before they combine for the final trunk. The method of making branches for model trees is to twist two or three wires together, leaving the wire ends free to be shaped to mimic the branching pattern of the species you wish to model. Start with two wires laying side by side, roughly even at the top. Grasp the wires at the point where you want your branch to fork, and twist the wires together so they hold tightly to one another down the entire length of the wire as shown. For your first attempts, make small shrubs or short trees until you get used to the technique! Make another group of three wires in a similar fashion. Try to avoid wrapping the wires around each other, you want to twist them as they lie side by side so there will be less of a gap between the wires. Prepare several groups of two and three wires, most shrubs or trees, even small ones need a minimum of fifteen lengths of wire to make a realistic branching shape. For your first model trees, it is easiest to work in three sections. To make each section, lay two of the wrapped branchlets you made in the last step side by side as if they were individual wires. Decide where they should fork below the tips of the branches, grasp your wires at that point and twist them together below where you are holding them. Leave the wires separated above the fork as shown in the photo above. Combine your remaining branches from the previous step so that you end up with three sections of at least five wires each. In general, the canopy or top layer of a tree has branches which are of a similar length, leading back to slightly longer forks, and slightly longer forks on the next section as you get closer to the tree trunk. The free wires at the ends of your sections should all be roughly the same length, otherwise, it looks like your tree has uneven growing conditions (maybe part of it has been pruned or is growing up against a building.) In the photo above you can see how the length of the free wire ends makes the shape seem quite different between the two sections of a model tree, even though they are made from the same wire. At this point in the tree making process, don't worry about the bends in the free upper sections of your wire groups. Keep combining sections of wire, twisting carefully to blend each group of wires into a branch below where the clusters join. (see photo) Try to make sure your twists of wire continue to be even with the wire smoothly twisted together, so the branch starts to take shape without too many wire bumps. Even a small section of a tree like the one shown here is large enough to be shaped into a small deciduous tree or shrub. Keep combining your wire sections until you get to the size of tree you wanted (or you are unable to twist the wires together evenly. The wires should hold together neatly and not be loose below the branch forks. When you have at least fifteen wires twisted together, take tweezers or your fingers and bend the trees out from the twisted trunk at the correct angle for the type of tree you are hoping to make. Some trees branch out at steep angles from the trunk, others (especially pruned trees) may be pulled further away from the trunk. Trees with a narrow columnar pattern of growth may keep their branches vertical and close to the trunk. In general, trees branch so they evenly share the light from the sun. Try to bend and shape your wire ends to give your tree the right branching for the materials you want to hang on the tree (jewelry, photos or baubles) or so they will look natural when you add paper leaves, moss, or railroad landscaping materials. Look down on the top of your tree to make sure you have shaped the tree evenly around the trunk as well. When you have your wires shaped the way you want them for your model tree frame it is time to cover the twisted wire with something resembling bark. Each type of tree has a distinctive bark pattern and color. Some have shiny bark, others have deeply ridged bark with a matte finish. Basic nonspecific deciduous tree forms can be coated with a layer or more of burnt umber acrylic paint. Applied with a stiff bristled paint brush, the paint is used to disguise the twisted wires that make the tree frame. In between coats, set the base of your tree trunk into the hole on a reel of sewing thread, or into a bit of florist's foam, to hold the tree shape upright while the paint dries. To mimic some types of bark you may need to use acrylic paint mediums added to your paint to adjust the gloss or paint texture so it more closely resembles the type of tree you want to make. You may also want to use blends of acrylic colors to mimic particular types of bark. Some trees may need a layer of thin paper or tissue paper wrapped around the trunk and then painted to give a more realistic bark effect (birch or aspen for example. The layers of acrylic paint used as bark will help to hold the wires together as well as disguising the twisted layers of wire. Experiment and see how many different types of tree you can mimic with changes to your simple wire tree frames.